Town’s ‘gateway’ pub was victim of lakeside project | The Dacorum Heritage Trust Ltd. The Waggon and Horses used to stand proudly at the entrance to Marlowes, a short way from the earlier Plough roundabout. It was first built on the site in the mid 19th century and started life as a small beer house, run by John Hoar. The pub stood within a large area of land in the Marlowes known as ‘League Square’ – so called because the roads and alleys of that time made up a square, each side of which was equivalent to one league. Much of this land, including the pub and Albion Mill, was owned by Thomas Woodman the Elder. He was the founder of both an auctioneers, (Woodman Brothers), and a corn business and became the High Bailiff of the town in 1848. The land was sold off in March 1898 (Thomas had died in 1873) and the pub was bought by Glover and Sons, brewers of Harpenden, for £900. 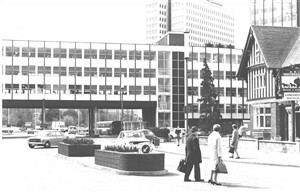 It was rebuilt in the 1930s on a much larger scale and sited further back, with a forecourt as part of the redevelopment of the area. Former landlords included Herbert Essam (1920s), Henry Pope (1930s) and Wimbledon FC footballer Bob Woodchild (1940s). 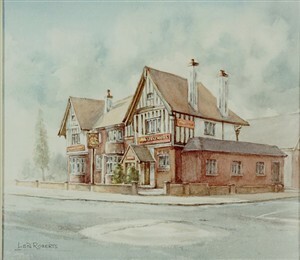 This much loved pub was again demolished in 1989 to make way for a new lakeside shopping development, which never materialised at the time. The artist, Len Roberts, was born in Guernsey and has always possessed a keen artistic eye, winning art prizes as a schoolboy. After he left school, he was employed in the art department of a company in Brighouse, West Yorkshire. He moved to Hemel Hempstead in 1970 and spent some time in Warners End. He has exhibited in the local area many times and won the BP Oil Ltd Painting Competition as well as prizes in the Aylesbury Festival of Arts.